Like thousands of technology-driven consumers, our family recently upgraded an older laptop. As a Christmas gift, my daughter received an Intel Core i3 Windows laptop. The new laptop replaced her well-worn Intel Core 2 laptop. That old Core 2 was my previous development laptop. It had been upgraded from Windows XP to Windows 7 Pro. It also had its RAM increased and a bigger hard drive installed. But after a few years of heavy use, it seemed painfully slow, bloated with endless software installs and Windows updates. It was certainly too under-powered to support an upgrade to Windows 8. With four family members usually upgrading their laptops every 3-4 years, my daughter’s old laptop was destined to join a growing stack of ‘retired’ electronics in our basement — until today. In just a few hours, I transformed that laptop into ‘mean, lean, open-source-breathing, Ubuntu-powered machine’. Okay, well maybe not that dramatic, but a signification increase in performance and lifespan non-the-less, at no cost and with minimal effort. I am a huge fan of Oracle VM VirtualBox. I have three other machines running Linux VMs on Windows. However, a VM is no substitute for a dedicated system, especially on a laptop. There are increased system requirements to run the host’s OS, along with VirtualBox, and the VM’s OS. At the same time, there are often limitations on the VM’s OS. I had wanted a dedicated Ubuntu laptop for a while, and this was my chance. My thoughts after a month with the laptop? First the cons. Some issues transcend the operating system. Although, the battery life has improved slightly with Linux, the battery is approaching end-of-life and needs to be replaced. Also, the laptop continues to run hotter than it should. However, it doesn’t suffer the occasional shutdowns from overheating and constant loss of wireless that it did with Windows. Lastly, the screen is starting to lose it brightness, but is still usable. The pros? 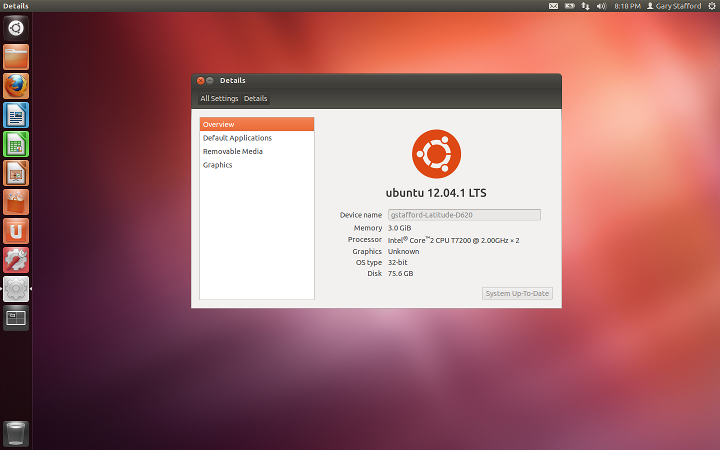 Limited memory is not as much an issue with Ubuntu as is with Windows. Ubuntu starts up in a fraction of the time it took Windows. 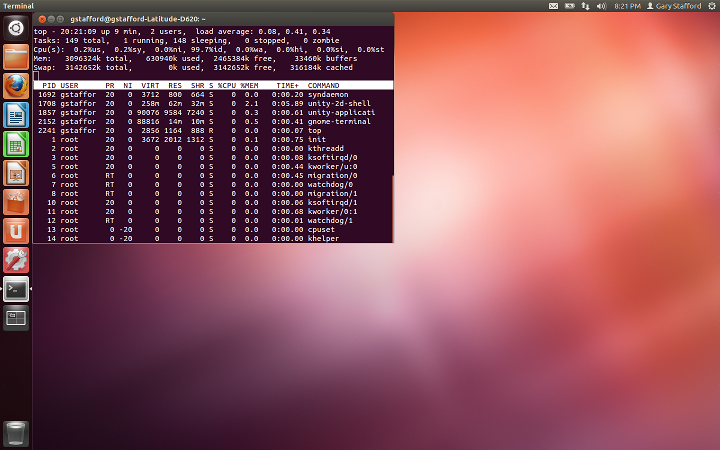 All the laptop’s components worked out of the box on Ubuntu with no driver issues. All the applications I use on Windows are also available on Ubuntu, or there are good alternatives. Lastly, using free services such as Dropbox, Ubuntu One, and Google Drive, I can author and store all my documents in the Cloud, and transfer them seamlessly between Linux and Windows when necessary. What’s not to love? Overall, I’m satisfied enough to use it as my personal laptop. I carry the laptop with me daily for Java, C++, and Python development, emailing, blogging, and web-surfing. Next time your temped to retire an old laptop, consider extending its life and saving yourself the cost of a new laptop with Linux. This entry was posted on January 29, 2013, 8:15 pm and is filed under Software Development. You can follow any responses to this entry through RSS 2.0. You can leave a response, or trackback from your own site.